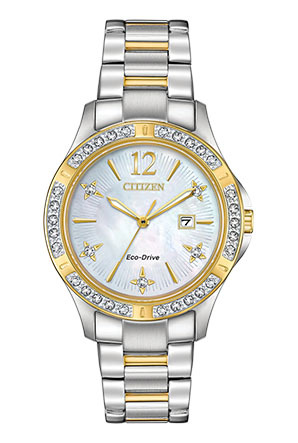 A timepiece that is uniquely beautiful, the CITIZEN® Elektra has dazzling diamonds on both the bezel and dial markers. Shown in two-tone stainless steel with a white Mother-of-Pearl dial. Featuring our Eco-Drive technology – powered by light, any light. Never needs a battery.